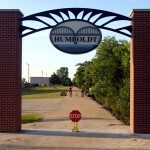 Humboldt (Mile Marker 117.0) is a historic city of 1,953 (as of 2010 census), located at the southern end of the Southwind Rail Trail /Prairie Spirit Trail corridor. The trailhead at the northern edge of Humboldt features a kiosk shelter and decorative arch. At the end of the trail, riders can follow a bike route (denoted by sharrows) into town where they can find numerous services and points of interest. There is hope of one day making a new trail to connect Humboldt to Chanute, which would fill a “missing link” in the regional trail network, providing a connection between the Southwind Rail Trail and the Western Sky Trail, which is a new trail being developed between Chanute and Fredonia (and ultimately further west towards Wichita). Heading north from Humboldt on the Southwind Rail Trail, the trail is well-shielded by trees for most of the distance. There is a picnic shelter at the halfway point between Humboldt and Bassett, which make a natural resting point. Also, note the many relics of the trail’s railroad history, such as signaling stands and switchboxes.